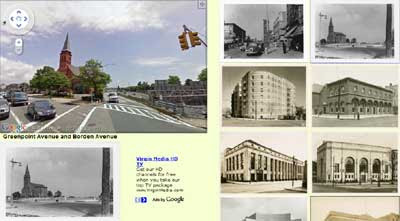 This website allows you to view historical photographs of New York alongside the current view as seen in Google Maps Street View. Thumbnails of the historical photographs are displayed on the right side of the screen. If you click on a thumbnail the Street View will change to show the modern day view. All the photos on this site come from the New York Public Library Digital Gallery and all the coding was done by yours truly. Ironically for a blog about Google Maps the one thing missing is a Google Map. This is mainly due to the fact that I couldn't fit a map into the screen and display all the thumbnails. If I have time I might try and create a tab in the Street View so that so that it is possible to switch to a map view.